The ingenious design behind Errol Morris’s indelible trademark of showing people making eye contact with the camera. Think about it: How does Morris get such penetrating interviews if the interviewee is just looking at a camera? If they’re looking into the lens and not at Morris, it would be hard for Morris to get anything like the unsettling, revealing, startlingly personal interviews that are Morris’s bread and butter. Would you tell a flat piece of glass about the biggest mistake you ever made in your life? 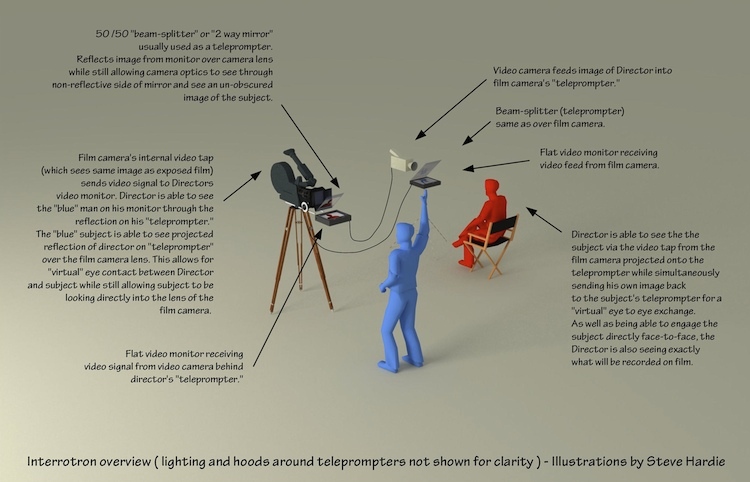 By shooting through a simple two-way mirror with a video monitor mounted under the camera lens, Morris can film his subject and make eye contact with him/her from the exact same angle. But that’s only half of it. The real genius of the Interrotron is that it’s a two-way street: the same mechanism gives the interviewee continuous eye contact with Morris, as well. No hiding behind a monitor while lobbing awkward questions for this director; Morris, who’s known to interview people for literally dozens of hours, doesn’t fake the intimacy you see on camera. 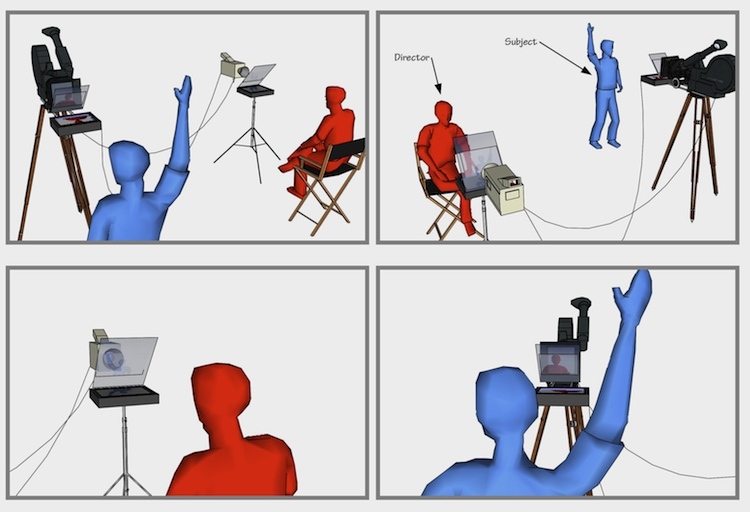 It’s the real outcome of an intensely human process — and the Interrotron’s subtle design genius humanizes the filmmaking process enough to break down the subject’s emotional barriers. Luckily, the basic idea is simple enough that any enterprising filmmaker could probably build her own if she really wanted to. And these technical illustrations (prepared by production designer and frequent Morris collaborator Steve Hardie) should make that process even easier.